Beautifully engraved certificate from the Treasury Department / U.S. Internal Revenue issued in 1926. 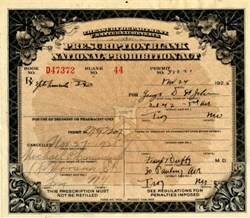 This historic document was printed by the American Banknote Company and has an ornate border around it and is handsigned by the doctor issuing the prescription. The prescription was issued for "spiritus fermenti" (fermented spirits ie whiskey). The certificate has the patient's name, dosage, prescribing physician, name of "druggist or pharmacist", etc. This were issued from Troy, New York. The Prohibition Act of 1920 marked an interesting chapter in American history. As early as 1916, long before Alcoholics Anonymous, twenty-three states had passed antisaloon laws to eliminate alcohol consumption. This controversial legislation was an attempt to reduce crime and corruption while improving the nation's health. In 1820, the Federal Government passed the 18th Amendment to the Constitution, known as the Prohibition Act. This widely supported "noble experiment" as Herbert Hoover called it, prohibited the manufacture, sale and transportation of liquor. Initially supported by the American public, widespread disillusionment quickly grew. Most communities had thriving "speakeasy" businesses which sold alcohol. These underground saloons did a booming business, creating bitter rivalries, gangland warfare and murders. Notorious gangsters like Alphonse "Scarface Al" Capone made a fortune. If someone wanted to obtain liquor legally for medical reasons, they needed a prescription from their doctor. Fortunately, prohibition was finally repealed in 1933 in the midst of the Depression.